Frame Size (H x L): 16.5" x 13.25"
Flag Size (H x L): 8" x 5.25"
15 star American parade flag with 13 stripes, printed on coarse, glazed cotton. The stars are arranged in a medallion configuration that consists of a huge center star, surrounded by 10 stars, with a flanking star in each corner of the blue canton. Note the elongated arms of the stars and their great whimsical imagery, as well as the striking colors of the flag with its royal blue canton and chromium orange stripes. 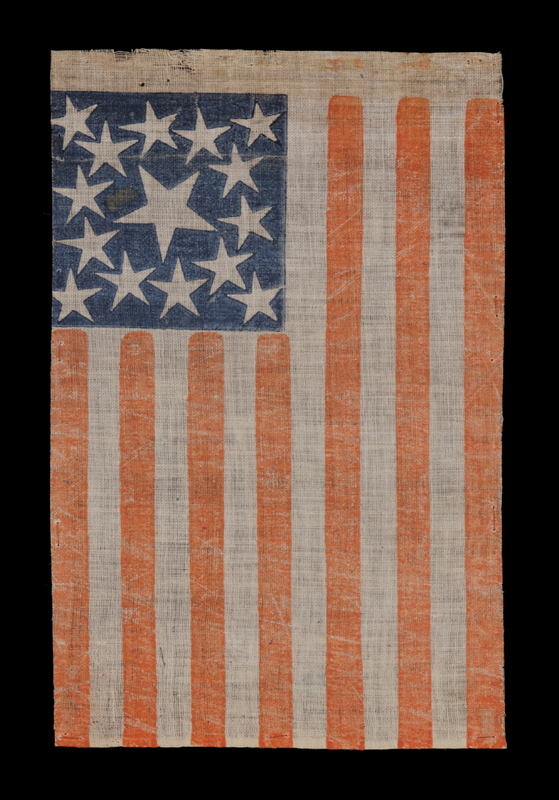 A group of flags in this exact style was found along the Ohio border, rolled up together with a group of 35 star parade flags in a known but rare style, which were quite obviously made at the same time by the same maker. Their date of manufacture date is late Civil War, reflecting the addition of West Virginia as the 35th state in 1863. The count of stars on the 15 star variety serve one of two likely functions. One possibility is that they represent the number of states that the maker felt were allied with the South. There were 15 Slave States and those which did not actually secede were considered Border States. Another possibility is that they were made to glorify Kentucky, specifically, which had became our nation’s 15th State back in 1792, shortly after the Revolutionary War. The citizens of Kentucky were now involved in a dilemma regarding their allegiance. Men from Kentucky served on both sides of the current conflict. While the state attempted to maintain neutrality, the invasion by Confederate troops in 1861 prompted them to call upon Union forces to drive out the Confederate Army. On November 20th of that year, while in a state of unrest, the people of Kentucky formed a group styling itself as a "Convention of the people of Kentucky". With 200 participants representing 65 counties, the group voted in favor of secession and the Confederate States of America formally admitted Kentucky on December 10th, 1861. Because the vote wasn't ratified by the state legislature, (as was the case in the first 11 Confederate States,) Kentucky is considered a Border State. A different although similar situation occurred in Missouri. Unlike the other Border States of Maryland, Delaware and eventually West Virginia (admitted as a free state in 1863, but with distinctly Southern sympathies), Kentucky and Missouri are represented among the 13 stars on most Confederate flags in the Battle Flag / Army of Northern Virginia format. For this reason, 15 stars and 13 stripes could bear a distinctly Southern meaning. Because both this 15 star variety is so rare, and because this group was found so near to Kentucky, it is logical to suggest that the design may have been intended to be marketed to the residents of that state specifically, or perhaps in a nearby metropolis, such as Cincinnati, which has a distinctly Southern lean, situated along the Kentucky border. West Virginia borders both Ohio and Kentucky, which draws another possible parallel to the flags’ regional use. This is unusual, as flags with 35 stars were flown nation-wide by Union supporters, just as 50 star flags are in use today across the country and around the world and bear no specific relevance to the 50th state, Hawaii. While it may be simply coincidental that the flags were found in close proximity to Kentucky and West Virginia, it does raise suspicion that there might be some reason for flags in these two star counts having been found together. They do, after all, relate to very important times in their respective political histories. The fact that so few 15 star flags exist raises their interest among collectors who wish to own a flag in that star count, irrespective of the period of its manufacture. Though the original 15-star period was quite long (unofficially from 1792 -1817 and officially from 1795 – 1818), only a tiny handful of American national flags made prior to the 20th century exist that have 15 stars. 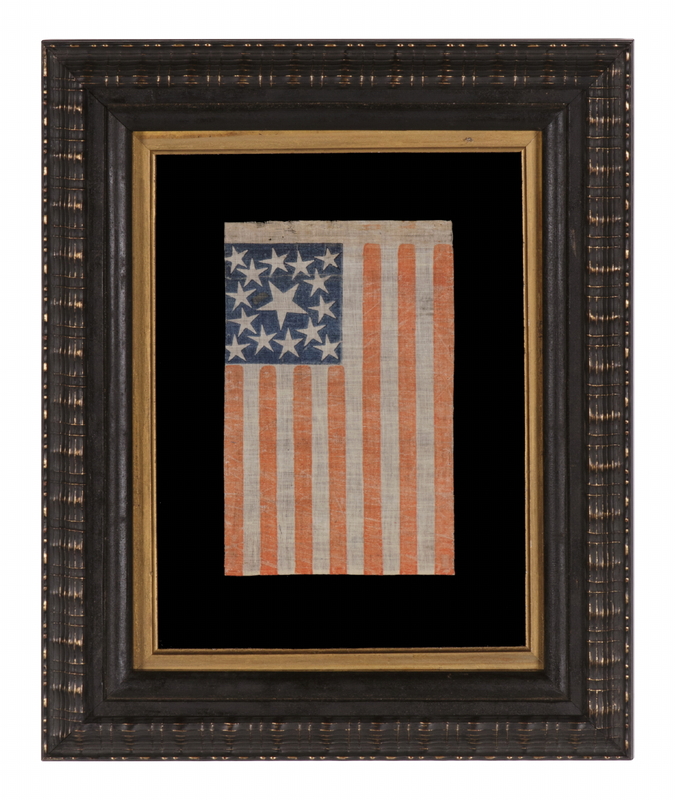 The most notable among the 1792-1818 examples is the Star Spangled Banner, made by Mary Pickersgill in Baltimore, Maryland, flown at Ft. McHenry, and about which the famous song was written by Francis Scott Key during the War of 1812. 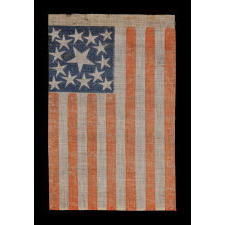 In addition to that flag, which now resides at the Smithsonian, there may be four or five others world-wide that have thus far surfaced from this very early period. These have 15 stripes, instead of 13, because at the time the logic was in increase the stripe count along with the number of stars. 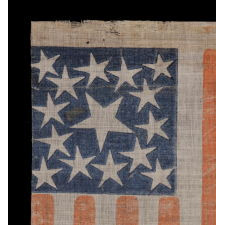 Another small group of 15 star flags also exist that instead date to the mid-19th century, generally between the Mexican War (1846-48) and the Civil War (1861-65), or perhaps just after. These may have served as U.S. Navy small boat ensigns, pilot house or stern flags. 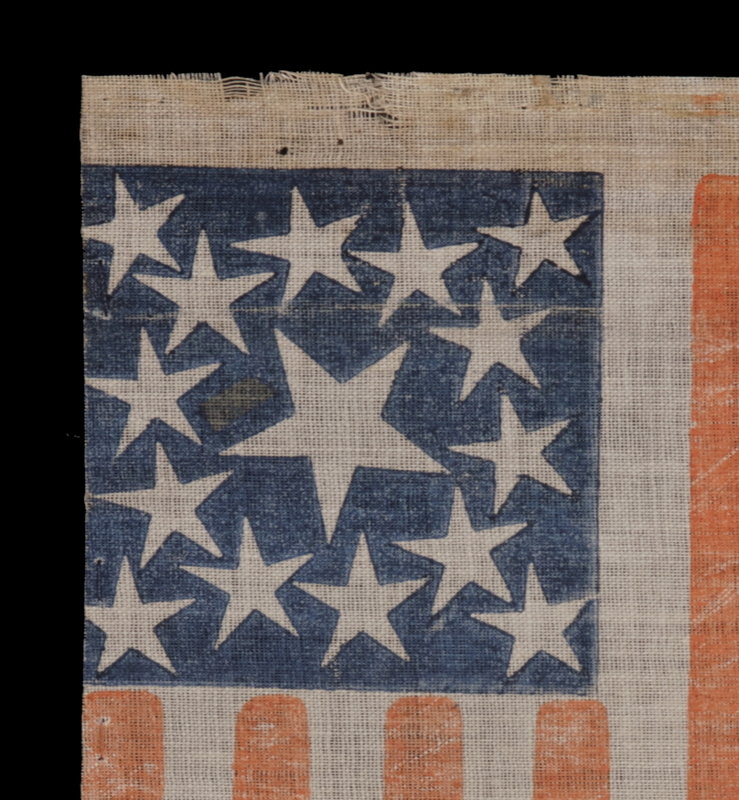 Out-of-period 15 star flags consistently have 13 stripes instead of 15 and construction characteristics that are consistent with their period of use. One other style of printed parade flag with 15 stars is known that is very similar to this, but lacks some of the strong folk qualities. An example of this style is documented in “The Stars & Stripes: Fabric of the American Spirit” by J. Richard Pierce, (J. Richard Pierce, LLC, 2005), p. 11. 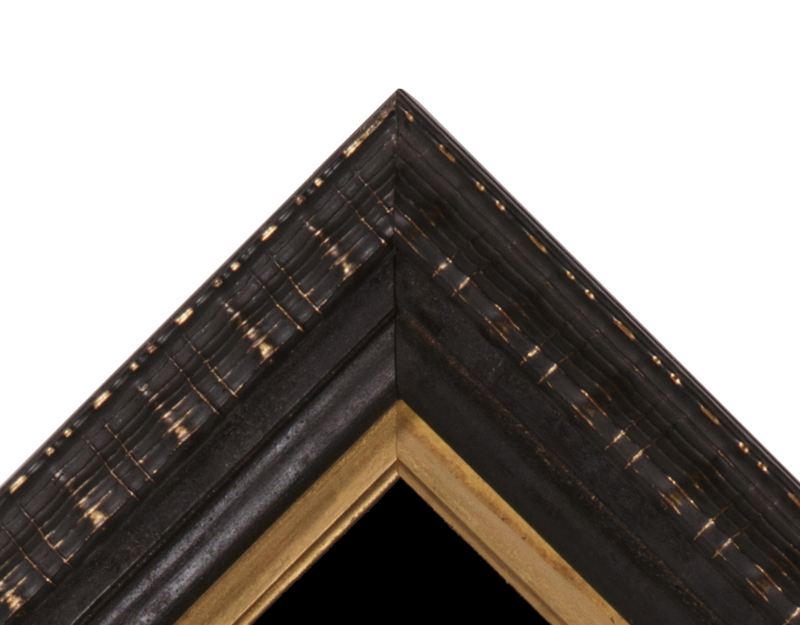 The three-part frame consists of a black-painted, 18th century molding in original surface, to which a modern, ripple-profile molding, black with gold highlights, was added as a cap and a gilded, late 19th century molding was added as a liner. 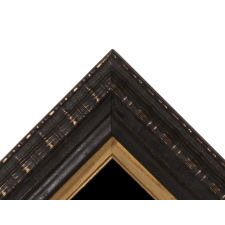 The background is 100% cotton twill, black in color. Feel free to contact us for more details. Condition: There is minor staining along the hoist, where the flag was once attached to its original wooden staff. There is moderate fading of the red-orange stripes and there is minor pigment loss in the canton. 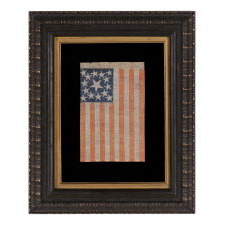 The great rarity of this example warrants almost any condition and the flag presents beautifully.